There’s no such thing as too much growth in the highly competitive fresh produce business—as long as you have the right tools and skillset to cope and keep up with it in step with market demand and trends. Which is exactly what the Burlington, Ont.-headquartered Ippolito Fruit & Produce Ltd. has managed to accomplish on a consistent basis for over 70 years, and counting. Founded in 1946 in Hamilton by Carmelo and Filmonell Ippolito, the modest local produce wholesaler has grown in proverbial leaps and bounds under the ownership of four successive generations of the company’s founding couple. 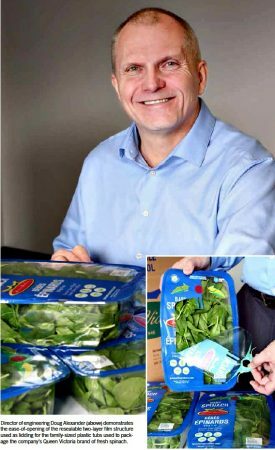 Director of engineering Doug Alexander (above) demonstrates the ease-of-opening of the resealable two-layer film structure used as lidding for the family-sized plastic tubs used to package the company’s Queen Victoria brand of fresh spinach. Nowadays operating four affiliated prospering businesses under the Ippolito Group corporate umbrella, the vertically-integrated grower, packer, processor and distributor of a broad range of fresh produce and salad mixes for retail, wholesale and foodservice markets across eastern Canada is embarking on yet another major growth-driven expansion—prompted by the modern consumers’ reignited love affair with fresh spinach. 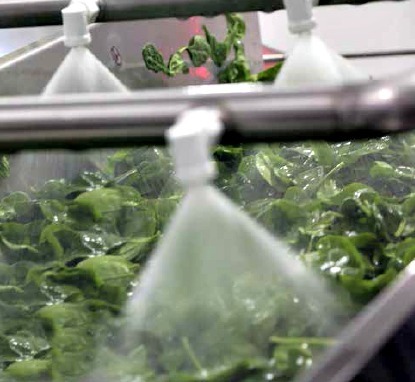 Plastic totes filled with fresh-packed spinach are continuously fed onto the two highly-automated packaging lines recently installed at Ippolito’s new processing facility in Burlington straight from the freezer to create a solid-state product flow with minimized exposure to air and light. As one of today’s trendiest so-called ‘superfoods,’ lauded for its rich iron content and many other nutritional benefits, spinach has actually been at the heart of Ippolito’s business throughout most of the company’s existence, with its bestselling Queen Victoria and Frisco’s brands enjoying steady market share growth since well before the turn of the century. And while the company’s product portfolio has grown and diversified significantly over the past couple of decades—now comprising of over 200 high-quality SKUs (stock-keeping units) ranging from lettuce and Brussels sprouts to squash, asparagus and ready-to-cook vegetable mixes—processing and packaging fresh spinach remains an around-the-clock, year-round activity driving many of the company’s important strategic decisions on capital investment and resource allocation. The high-efficiency Turetti washing systems installed at the new Burlington spinach processing facility employ an innovative counter water flow method to wash the product, which has reduced the lines’ water consumption requirement by half from previous levels. 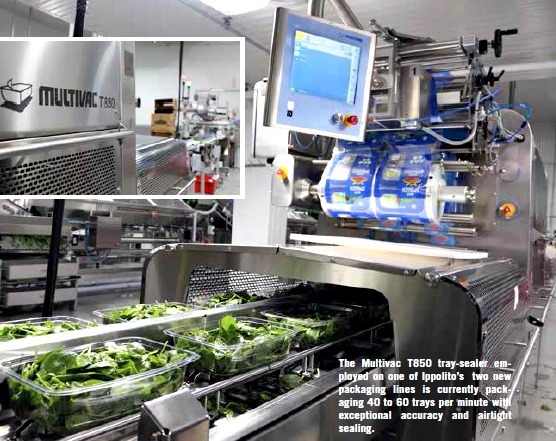 Already ranking as the largest privately-owned fresh produce supplier in Canada, Ippolito has recently started up two new state-of-the-art spinach processing and packaging lines at a newly modernized, 75,000-square-foot facility located a few city blocks away from its elegant central headquarters building in Burlington’s east end. Commissioned, assembled and integrated under the watchful eye of Ippolito’s director of engineering Doug Alexander, a 30-year food industry veteran with extensive production and process control experience under his belt, the two new side-by-side lines are already setting new productivity and quality control benchmarks for other Ippolito facilities to emulate down the road. Requiring minimal human supervision or intervention, the two fully-integrated production lines at the new Burlington facility can each package up to 1,500 pounds of fresh spinach per hour. “Over the years, Ippolito has succeed in becoming the supplier of choice for leading retail and other customers by maintaining very high product quality and food safety standards in combination with high service levels—offering them our product the way they want it and when they want it,” Alexander told Canadian Packaging on a recent visit to the new facility, operated around-the-clock in a chillroom environment maintained at 2°C temperature. 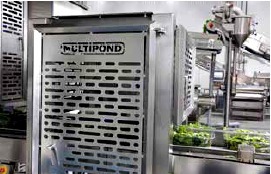 Boasting some of the most advanced, fully-automated processing and packaging equipment available in the market, the two nearly identical lines—one for bagging and one for tub-filling—were designed to enable the plant to turn out over 3,000 pounds of packaged produce, mostly spinach, per hour, with minimal human intervention. “One of the primary goals in the design of the new lines was to bring the levels of human intervention and manual labor down to a minimum,” says Alexander, “and I think it’s a mission accomplished. “Being a 24/7 operation, processing 3,000 pounds of loose-leaf product 12 hours a day, seven-days-a-week, was always going to be a tall order,” Alexander relates, “but thanks to the collaborative approach we used in working closely together with all or key suppliers, we accomplished exactly what we set out to do. “This was not just your usual design-and-build project,” Alexander points out. 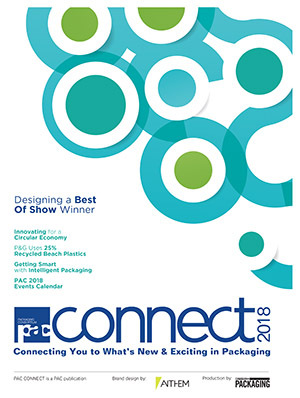 “The outstanding level of collaboration, commitment and professionalism our suppliers have shown from start to finish were absolutely critical to the success of this project,” says Alexander, singling out Burlington, Ont.-based packaging systems integrators Abbey Packaging Equipment Ltd. for special high praise. 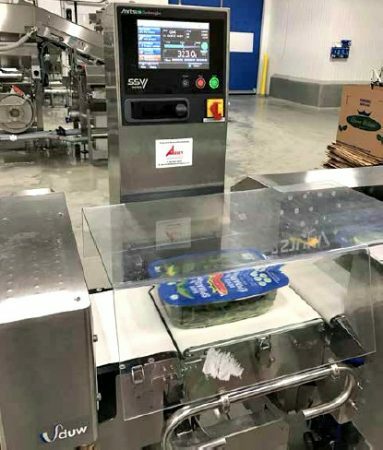 “When they tell you how a particular piece of equipment is going to perform on the line, you can really take their word for it,” says Alexander, citing a significant reduction in product giveaway enabled by installation of high-accuracy Anritsu checkweighers near the end of the two packaging lines. “Abbey promised that they would reduce our average product giveaway down to two per cent per package, and that’s exactly what we have experienced,” he extols, citing a nearly 10-fold improvement in product overfills. “Before they [Abbey] sell you a particular piece of equipment, they make it a point to understand exactly what your needs and problems are well ahead of time, so that the equipment they recommend has a direct positive impact on improving your productivity levels and line efficiencies,” Alexander relates. “We have had an Abbey technician onsite here almost every day for seven months to make sure that everything they installed ran at optimal performance levels,” he recalls. “I can’t say enough about how happy I am with their quality of their service, technical expertise and, of course, the high-performance equipment they delivered, installed and tested for these two new lines. In similar spirit, Alexander extends considerable credit to the Elora, Ont.-based Mallot Creek Group Inc. and Fedtech Construction Corporation of Vaughan, Ont., for the “top-class” construction engineering work involved in completely overhauling and transforming a mothballed warehouse facility into a modern, spanking-clean food manufacturing plant certified to the demanding SQF Level 2 global food safety standards of the Safe Quality Food Institute. While Ippolito makes the most of Ontario’s growing season to source its fresh spinach locally, maintaining year-round production naturally requires it to import its greens from U.S. southwest during the winter months, meaning a three-day transport from the fields to the processing plants in Burlington. 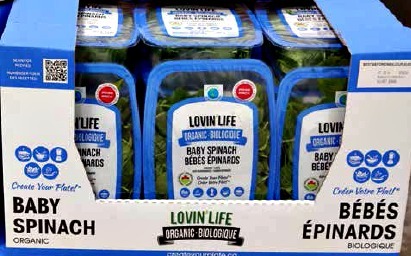 To get maximum shelf-life from this product, Alexander says it is imperative to get the incoming shipments bulk spinach sorted, packaged and stored for shipping as soon as possible. “Plants like light, water and oxygen, and if you want them to stay fresh you have to reduce those factors by keeping it dark, keeping it dry, and by reducing oxygen exposure to a minimum,” he explains. To offset that, the two new lines are fed directly from the cooler via a steady flow of filled plastic totes conveyed from the cooler to the front end of the production area. 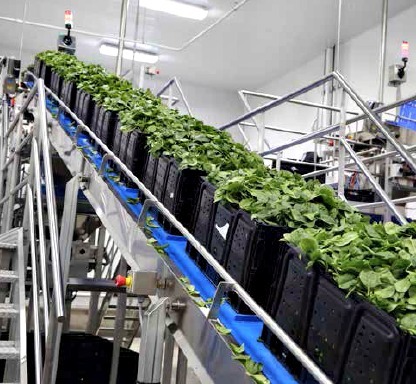 The plants are then swiftly transported by a custom-built elevator, constructed by Janz Manufacturing, up to the mezzanine level and placed onto an inclined conveyor belt. From there, the totes move through the high-efficiency Turatti washing and energy-efficient drying and chilling stations for a thorough spray-rinse, after which they are swiftly transported by a custom-built elevator—constructed by Janz Manufacturing—up to the mezzanine level. Once there, the spinach is quickly loaded onto an Unrtsun vibratory feeder to shake off the extra moisture and separate the loose leafs from one another before they go through the optical sorter for grading. Speeding up all these preparatory steps has enabled the new lines to complete steps double the speed of the entire “feed-to-skid” cycle from 45 to about 22 minutes, according to Alexander. “This is much more efficient than having the product sit around and wait in the staging area, where it is exposed to light and heat,” he relates. “At our other plants we would feed the spinach into a big bin for about 30 minutes, and would run the product in batches, making one big pile after another. “The problem is that leafy greens don’t work very well with the inconsistent feeding you get with the batch process, whereas doing it this way allows us to control a steady state product flow right through the line, ultimately resulting in vastly reduced product waste. 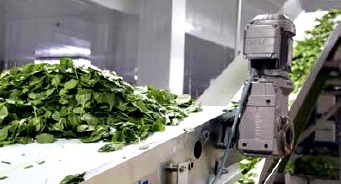 After the vibratory feeder separates bulk product into individual leaves, the loose spinach moves through a state-of-the-art Raytec Vision optical sorter for a thorough, high-speed product inspection to remove all unwanted foreign object sand sub-par quality leaves out of the product stream. “This sorter allows me to grade each individual leaf and to detect any foreign material within the product mass, as well as to detect rot and other blemishes on the leaves that need to be caught and rejected,” says Alexander. “We had an unacceptably high percentage of food product waste in automatic product inspection systems for our previous lines,” he acknowledges, “but the new Raytec sorter has reduced that to less than four per cent, depending on the quality of raw materials coming in. 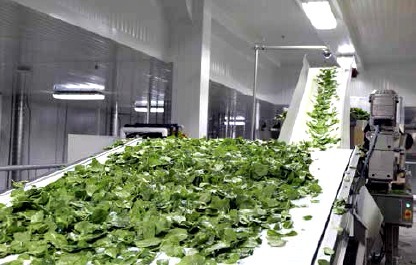 “The system provides individual leaf inspection at one meter per second, enabling us to move 1,500 pounds of product an hour per each line,” Alexander remarks, praising Jantz Manufacturing and Abbey Packaging for integrating the sorter with the elevator and vibratory conveyors to make it all run like clockwork. “The two companies collaborated very closely to bring this very unique design concept to life, enabling us to make big strides in productivity and accuracy,” he states. Adds Abbey Packaging service manager Derek Wood: “The Raytec optical sorter is there to get anything that’s no organic out of the product stream. “Because spinach is collected in the fields and transported on trucks over long distances, there are many ways and opportunities for foreign objects and debris to get in along the way, including branches, sticks, seeds, bugs and many other things consumers do not want in their product,” explains Wood. In addition, the sorter also detects any rot or unsightly spots on the individual leaves during the inspection, note Wood, gently blowing them off the conveyor belting with a jet of compressed air. “You want to do this at this stage because you don’t want to be rejecting an entire finished tub of product because of one bad leaf later in the process,” says Wood. As Wood explains, the Raytec optical sorter deploys two high-speed cameras positioned at the top of the machine—a visible light camera and an infrared unit—pointed to look across the entire belt and to interact with an array of diodes positioned on the opposite side of the belting. “As the product moves forward, the system flashes three colors of RBG light (red, black and green), the camera takes a picture with each the three lights, and overlays the images on top of each other over an RBG spectrum to identify and display the leaves visually,” explains Wood. Piles of freshly-washed loose-leaf spinach transferred along a vibratory conveyor, powered by an SEW-Eurodrive motor, to shake off excess moisture. 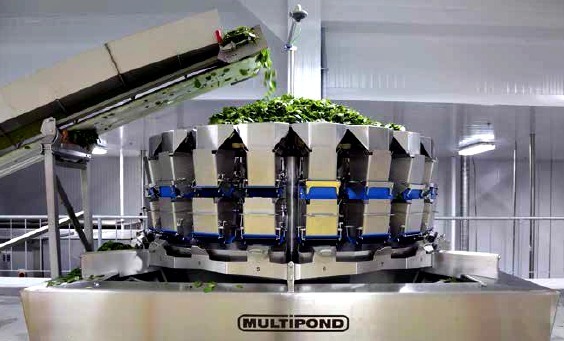 After leaving the sorter, the inspected spinach leaves are conveyed to fully-automatic, stainless-steel Multipond weighscales—featuring highly sanitary design and special ‘sharp-tooth’ mechanisms to ensure optimal dispensing of the loose product down to the packaging machines below. “Our Multipond automatic weighers’ automatic feeding mechanisms allow us to handle a very challenging product that does not move very well, and also tends to gather together in clusters and clumps,” Alexander notes. “The energy transmitted from the vibratory feeders to the top of the scale helps us to fill the buckets very accurately, almost to the leaf. “What that means in the end is that a 312-gram package will have seven to eight grams of overfill, rather than 60 to 70 grams we may have had previously,” he points out. 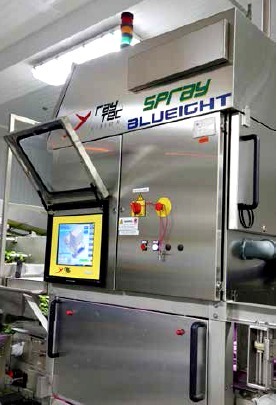 The Raytec Vision optical sorter uses high-speed light and infrared cameras to detect and remove field debris and poor quality leaves from the product stream before packaging. Arranged on each line in 10-bucket configurations, the 3.8-liter buckets direct the products downward to another Abbey-supplied product distribution system that splits each deposit into two equal halves per bucket—thereby enabling simultaneous packaging of four packages at a time, or two per packaging machine. One of those packaging machines is a brand new fully-automatic Multivac model T850 tray-sealer that puts loose spinach into rectangular, clear-plastic tubs sealed with a layer of high-barrier two-layer plastic film at speeds of 40 to 60 tubs per minute, albeit Alexander is sure he’ll be able to raise that throughput rate up to 80 tubs per minute after a few more process refinements. The fully-automatic multibucket Multipond weighscales feature special jagged-edge mechanisms that enable them to dispense the tricky loose-leaf product with optimal accuracy. “We believe that this is the most advanced tray-sealer installed anywhere in Canada,” says Alexander, praising the high-performance machine’s robust production capabilities and fully-automatic operation. Used to package clear rigid plastic tubs shipped to the plant by Peninsula Packaging Co. LLC, the high-speed Multivac T850 machine was specifically customized to enable inline application of a second layer of film coated with a specially-formulated food-safe adhesive, to create a resealable pull-tab. With a bright-red, easy-peel tab positioned near the top of the printed graphics, consumers can easily peel off the top film layer to open up a lager access area in the center of the package, take out what they need, and simply pad the tab back into place by hand to reattach it to the primary film layer below. The Multivac T850 tray-sealer employed on one of Ippolito’s two new packaging lines is currently packaging 40 to 60 trays per minute with exceptional accuracy and airtight sealing. “Thanks to this custom-engineered Multivac machine, we are able to get this challenging two-layer film construction onto the tubs at a remarkably high rate of speed,” says Alexander, citing an overwhelmingly positive consumer and customer feedback to the innovative resealability feature. According to Alexander, a Multivac technician spend about four months at the new facility to integrate the Multivac T850 into one of the two lines to achieve perfect synchronization between the tray-sealer and the Multipond scales, also installed by Abbey Packaging. 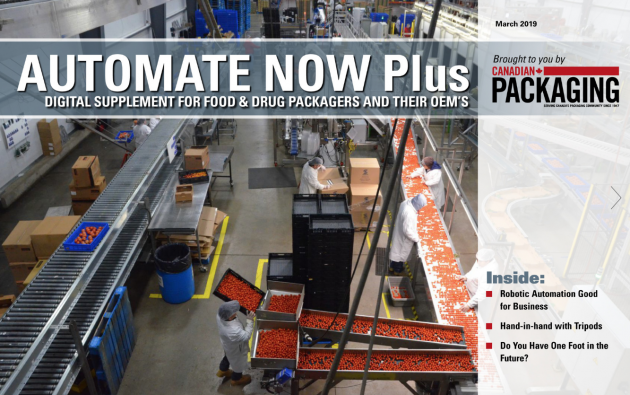 Supplied to Ippolito by Peninsula Packaging, the resealable family-sized plastic tubs coming off the Multivac T850 tray-sealer provide extended product shelf-life of at least 14 days, even accounting for repeated opening and closing of the package, without resorting to gas-flushing. “Multivac Canada provided outstanding service and commitment to integrating the machine seamlessly into the line in order to automate our process,” Alexander states. “The remarkable collaboration between Multivac, Abbey, Multipond and other key suppliers in connecting the entire system has yielded a highly efficient, continuous process that is all electronically linked from start to finish. 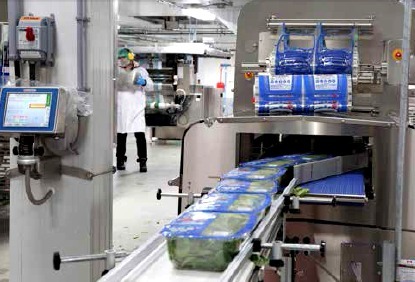 Alexander estimates that the Multivac system currently accounts for about 40 per cent of the plant’s daily output for time being, while the second line’s GEA–made SmartPacker horizontal form/fill/seal (HFFS) machine, also installed by Abbey, accounts for the rest—performing high-speed bagging of spinach inside breathable film pillow bags. All the finished resealable plastic tubs packaged on the Multivac T850 tray-sealer pass through a final quality assurance check administered by an Anritsu combination checkweigher-metal detector before proceeding on to the manual case-packing area down the line. That said, the fully-automatic SmartPacker bagger is a high-performance workhorse that incorporates advanced ultrasonic sealing technology to ensure 100-percent seal integrity on every bag it processes, according to Wood. 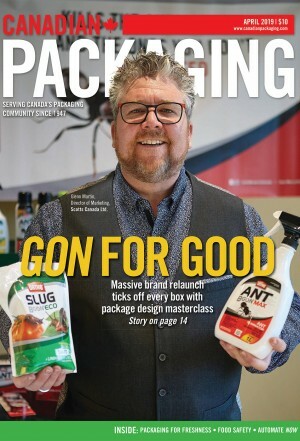 “It’s a fairly expensive technology to buy into,” he acknowledges, “but if it helps eliminate the five to 10 per cent of rejected bags you get with traditional heat-sealing methods, the end-user will eliminate a huge waste of both packaging substrates and raw product. “Processing salads requires complete product containment within the bag, and products like spinach and lettuce are hard to get into the bags at high speeds in their entirety, being both dense and prone to a lot of product movement. “Traditional heat-sealing methods can’t provide a perfect seal when you have a loose leaf of lettuce or spinach positioned in the sealing area,” Wood expands. “They’ll just seal around it—leaving small holes around the outline of the trapped product and resulting in a wasteful reject of the entire bag,” Wood says. “Imperfect seals are a huge concern in the produce industry in terms of food safety and product quality,” Wood points out, “and ultrasonic welding is a perfect way to address it. The new Ippolito processing plant uses branded pre-printed corrugated mastercases, manufactured by Atlantic Packaging Products Ltd., on PECO pallets to ship its product. 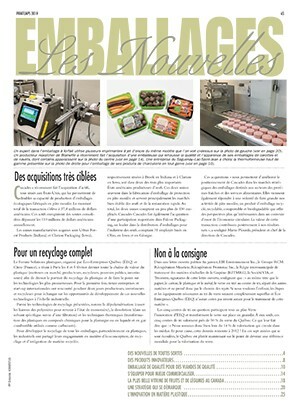 All the finished bags and tubs of spinach pass through the Anritsu SSV Series combination checkweighers-metal detectors for one last thorough quality assurance test, before moving further down the line for product labeling—performed by an Accraply label applicator—and product coding, expertly executed by a SmartDate X40 thermal-transfer printer manufactured by Markem-Imaje. 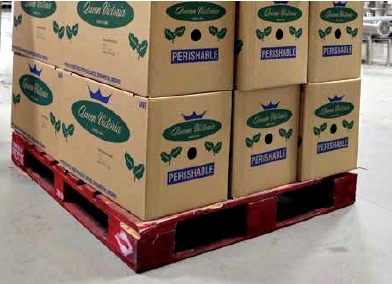 At the end of the line, the finished packages are manually loaded inside pre-printed corrugated shipping containers—supplied by Atlantic Packaging Products Ltd.—case-coded by another Markem-Imaje large-character printer using special wax-jet ink formulation, and stacked onto skids in five-layer pallet loads. 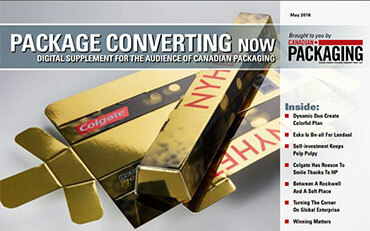 Toronto-based corrugated products manufacturer Atlantic Packaging also supplies the Ippolito plant with shelf-ready packaging for effective point-of-purchase merchandising. All in all, Alexander says he is “highly satisfied” with the way the entire $4.7-million capital expansion project came together. 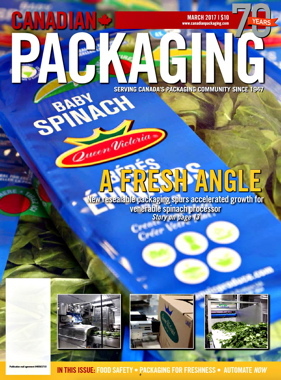 Please see an online video of the new Ippolito spinach packaging line in action on Canadian Packaging TV at www.canadianpackaging.com.